Since working in a district-wide position, I get to visit schools and classrooms all over my district. Deb Perryman is one of the teachers I enjoy to visit. She's a high school science teacher and I've learned so much about inquiry-based and service-based learning from her. It's clear that she's a passionate teacher - about her subject and also her students and she brings science to life in her classroom. Earlier this school year, Deb and her students organized a National Biodiversity Teach-In. The organized webinars for students with science experts all over the world. 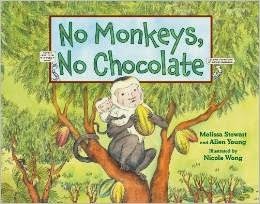 Melissa Stewart, the author of No Monkeys, No Chocolate hosted a National Schoolwide Read. I'm happy to share Melissa Stewart's book Perfect Pairs. 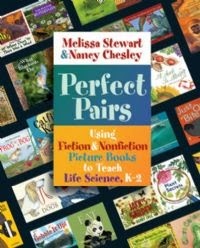 Co-authored with Nancy Chesley, Perfect Pairs: Using Fiction & Nonfiction Picture Books to Teach Life Science, K-2 is a great reference tool for teachers of science. Melissa and Nancy share how to lessons linked to the Next Generation Science Standards that use inquiry to engage students and picture books to introduce and reinforce concepts. They offer links to ELA and specific examples. Visiting Deb's classroom is great because I can see inquiry-based learning in action. She actively engages students in what they are learning. I love how Melissa and Nancy give ideas for this in Perfect Pairs as well. If I was teaching kindergarten, 1st or 2nd grade, I would love this resource. I hope they write a similar book for older grade levels, too!